This week, the American Sephardi Federation (ASF) wraps up its Moroccan adaptation of Shakespeare’s “Othello.” Performed at the Center for Jewish History in New York City, the production is the third in a series that ASF has adapted since January, incorporating Sephardic music and Moroccan costumes into dramatic classics. “This production is unique, because for the first time we will return ‘Othello’ to its roots, back to Morocco. The production will feature Moroccan music. I want to explore the Moroccan aspect of the play, returning it to Shakespeare’s original idea of using the inspiration of Abd el-Ouahed ben Messaoud, who was the ambassador of the Moroccan / English alliance in 1600. Shakespeare was very intrigued by this man, his clothes, costumes, traditions, looks and his darkness, which I want to explore. I hope to deliver an interpretation of Othello that is different, and bring a new understanding to this complex character. 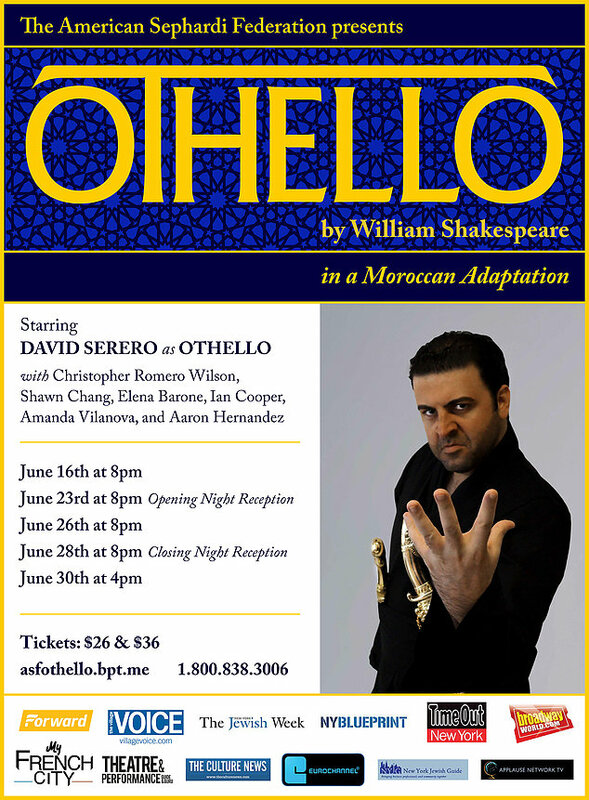 I intend for my interpretation of “Othello” to be personal, with roots in my own heritage : my dad was born in Morocco and instructed me in the ways of Jewish Moroccan culture. It is a little-known fact that numerous songs in the Arabic song repertoire are Judeo Arabic songs by such composers as Salim Hallali. And I will sing one of those songs as Othello.